The Glock is a series of semi-automatic pistols designed and produced by Glock GmbH, located in Deutsch-Wagram, Austria. The company's founder, engineer Gaston Glock, had no experience with firearms design or manufacture at the time their first pistol, the Glock 17, was being prototyped. Glock did have extensive experience with advanced synthetic polymers, and this knowledge allowed the company to design the first successful line of pistols with a polymer frame. Despite initial resistance from the market to accept a 'plastic gun' due to concerns about their durability and reliability, Glock pistols have become the company's most profitable line of products, commanding 65% of the market share of handguns for United States law enforcement agencies. 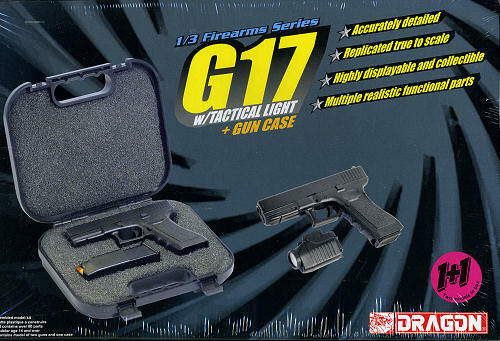 This particular kit has a complete plastic case with form fitted fo am along with two pistols. Both pistols have a trigger you can pull, a realistic bolt action and come with a detachable magazine and one plastic bullet for the top of that magazine. This boxing has an additional sprue that includes a tactical light. Not shown is the clear lens that is provided. I'd have though it would be functional using a watch battery, but such is not the case. The kit itself has metal springs for the bolt action and there is a metal rod for the hinge on the case. 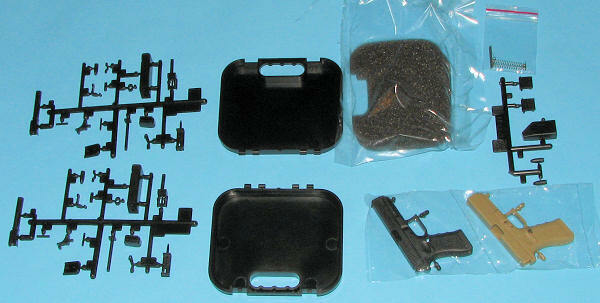 Also included are clasps for the case in plastic. I noted that it seems there is a working safety for the guns as well. 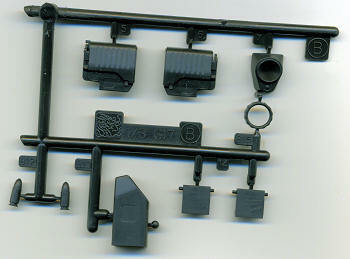 Molding is for the most part, in black plastic, though one of the gun bodies is molded in tan. Instructions include a painting guide for all the bits. This is what I guess you'd call a repeat with extras as the base kit has been provided before. I have to assume these are selling well or Dragon would have stopped the series. One thing for sure, unless you swallow it, it it not lethal!